After yet another 10 day trip to the states, it was wonderful to be back home. I wasn’t really wanting to go, having been gone so much, however the Lord greatly blessed the trip. Our home church, South Hill Calvary, had been prayerfully planning a "missions week" for almost a year. The vision behind it was to bring all of the missionaries they support, throughout the world, together for a time of fellowship, breaking bread, prayer and the word. There were 7 different brothers from Mexico, Germany, Austria and Croatia. Indeed it was an incredible time. How amazing it was to meet these guys and hear about all the incredible things the Lord is doing in other countries. Our time together reminded me of a passage in Luke 10. Jesus had just sent out 72 disciples to heal the sick and preach of the kingdom of god. We read in verse 17 that when they returned, "...they returned with joy..." In there excitement and enthusiasm about what they had just experienced, Jesus gently reminds them about the importance of humility. Nevertheless, do not rejoice in this, that the spirits are subject to you, but rejoice that your names are written in heaven" (Luke 10:20). Jesus wanted to make sure they didn't get caught up in what they did for the Lord...but rather what the Lord did for them. I think I can speak on behalf of all the missionaries there, that we had a renewed understanding that it is all about Jesus! On Monday we will be welcoming another missions team who will be installing a heating system in the orphanage. 10 brothers and sisters from 2 churches in Washington will be spending the week with us. We are prepping for the cold season and what a blessing it will be to have a heating system to keep the children warm. We also have some very exciting news, as another family, has answered the call to the mission field. Isaac and Tara Heist, from Bellingham Washington, have been praying about serving somewhere in Mexico. Over the course of a couple years, God confirmed to their family and to us, that they were to come down and serve at the orphanage. Originally they were thinking of coming down in January of 2015, however, the Lord had a different plan, which is usually the case. Their house sold incredibly fast, and it was clear that the Lord was saying it was time to go. So, having sold most of their things, Isaac, Tara, and their four children, JT, Asher, Isaiah and Jocelyn began the drive down. They arrived safely in El Paso yesterday, and it has been a blessing hanging out with them. Please continue to pray for this dear family as they start the new chapter in their life! Please pray for all 19 of us as we cross the border and travel back down to Bachininva Monday afternoon. Please pray for a healthy and productive week with the team. We are still in need of/looking for a 15 passenger van. Please pray that God would provide one in His perfect timing. If you know of one for sale or see one on the side of the road, please let me know. May your hearts be strengthened and encouraged today. Let us be reminded of all that Christ has done for us...and the peace and comfort we find in Him! For those of you who follow us on Facebook or Instagram, you have met our newest little addition, Esmi. Esmi is 7 years old and she is the sister of Tonio (who is also with us). She came into our care two weeks ago. Her father was killed 4 years ago and Esmi's mother is hoping for a better life and future for both Esmi and Tonio. Esmi is a beautiful and bright, yet very feisty young gal. We were able to enroll her right away in school and she is doing great thus far. Speaking of school, it has been exactly a month since the children started school and all 10 of them are doing well. Although some of are below the average student their age, learning wise, they are enjoying school and seem eager to learn how to read, write, count, etc! Our days now are quite different, especially in the morning. Getting 10 children ready for school can be a little tricky. Wakeup call is at 6:30 AM. The kids do a great job of getting dressed, making their beds and prepping their backpacks. We have breakfast at 7:00 and then walk the kids to catch the bus @ 7:40 AM. After school is probably the most important time of our day. The entire staff ceases doing their normal work duties and we spend 2-3 hours with the kids, tutoring and assisting them with their homework. I do my best to only help the elementary kids because I can understand their homework, especially math. I made the mistake onetime of trying to help the junior high kids and I was very humbled. At the age of 34, I have no clue how to do decimals, fractions, etc. It brought me back to my days of schooling and algebra…days that I try not to think about! As our family continues to grow, so do the needs. To fully and adequately care for a child at Casa de Bendicion, it costs $200 a month. This enables each child to have the proper care from the staff, food, clothes, school uniforms and supplies, medical and dental check-ups, private tutoring as well as money to help teach the children how to save and tithe. God has been faithful to provide 14 families, individuals and churches, thus far, that help support our children anywhere from $40-$100 a month. Our prayerful desire would be that every child would be fully supported on a monthly basis. This is where I would ask that if you, or your family, or church, might be interested in knowing more about this, or, have a tugging on your heart to help, please let me know. I don’t want to create just another “program” where people can “sponsor” a child on a monthly basis for “X” amount of dollars. We really want to build a relationship between the children at the orphanage, and those that support them. The support we are looking for is not just money. Obviously, when we moved down here, it was in faith, trusting that God would provide, and move and those hearts HE desires, to come alongside us. As I look back over the past 2 years, it is UNBELIEVABLE how God has been faithful to provide hundreds of thousands of dollars. The number of churches, families and individuals that continue to come alongside us, pray for us, visit us, etc, grows daily. I am confident that as God continues to bring the children, He will continue to bring the finances and resources as well. As we are seeking a commitment from people, we are making a commitment as well. We want to make sure that you have all the up to date information regarding the child you are supporting. Every 1-2 months we want to provide you an update with photos, prayer requests and praise reports, school report as well as an overall update of how your child is doing. We also pray that one day you might be able to join a missions trip, or just come down with your family to meet your child and spend some time hanging out and serving at the orphanage. Please take time to pray and seek the Lord on this and let me know if this is something that you would be interested in becoming a part of. "Blessed be the God and Father of our Lord Jesus Christ, who has blessed us in Christ with every spiritual blessing in the heavenly place" (Ephesians 1:3). Job, probably one of the most afflicted men in the bible, never ceased to praise the Lord. "Then Job arose and tore his robe and shaved his head and fell on the ground and worshiped. And he said, “Naked I came from my mother's womb, and naked shall I return. The Lord gave, and the Lord has taken away; blessed be the name of The Lord" (Job 1:20-21). Paul, learned what it meant to be content in the Lord, no matter what the situation looked like, good or bad. Not that I am speaking of being in need, for I have learned in whatever situation I am to be content" (Philippians 4:11). We know that God is in control of all things, and He is absolutely perfect. So whether we are glowing on that mountain high experience, or trudging through the depths of the valley, we can rest assured our God is in control! This past month, the Lord added greatly to our home...8 children within about a week. How exciting it was to see these beautiful new faces and watch The Lord begin to work in their precious lives. Obviously going from 4 to 12 children was a bit of a challenge, but nevertheless, a huge blessing. Just as the Lord has the freedom to add children to our home, He can also allow some to be removed, which is what has happened. The mother of the 4 siblings (Gael, Myra, Pablo and Adrianna) decided to take her children back. Over the short time they were with us, we had a number of meetings with the mom, sharing the Lord with her and our commitment to help care for and minister to her children. She was torn of wanting to have them with her but knowing she couldn't care for them properly. It became apparent though, that she was changing her mind and really wanted her kids back. We did our best to fight for the children, believing that truly the best place for them was in our care. Unfortunately, the mother saw things differently and because she is their legal guardian we released the kids back to her. This has been difficult, especially knowing that the children are being left home alone, and some of them are not going to school. However, we don’t lose heart, only because we know that God is constantly working behind the scenes. He loves those children more then anyone. I don’t know what the outcome will be, but I do know how big of a God I serve, who through whom ALL THINGS are possible. The 4 children left our home on a Sunday and then God brought us another young boy the following Sunday. Truly He does “GIVE” and “TAKE AWAY”. When we came back home from church this past Sunday, Aron’s mother was there, with her cousin Yvet and her little son Jose Antonio Diaz. 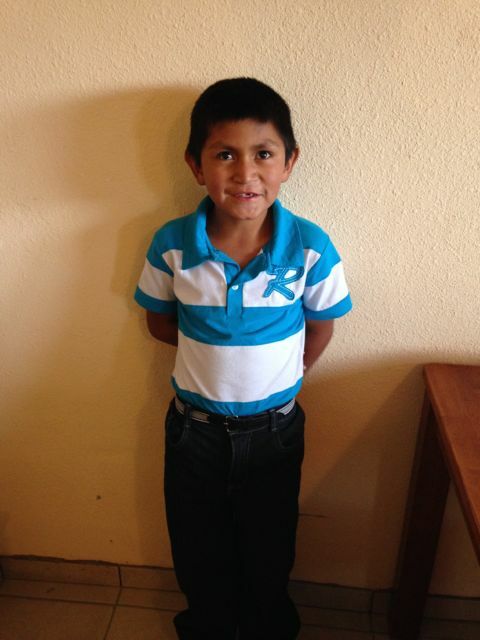 Yvet had heard about the orphanage from Aron’s mom and she wanted to bring Jose to us. Similar to a lot of our children, Yvet is a single mom, trying to work, raise kids, etc. She to has a desire to see Jose have a better life then the one she can give him. So, within an hour our so, we had processed in this young boy, our 9th child. Lord willing, Jose' little 6 year old sister, will be joining us as well within a few weeks! Brothers and sisters, there may be times when the Lord gives, and there may be times when He takes away. May we always seek and desire to never cease to praise and bless His holy name!